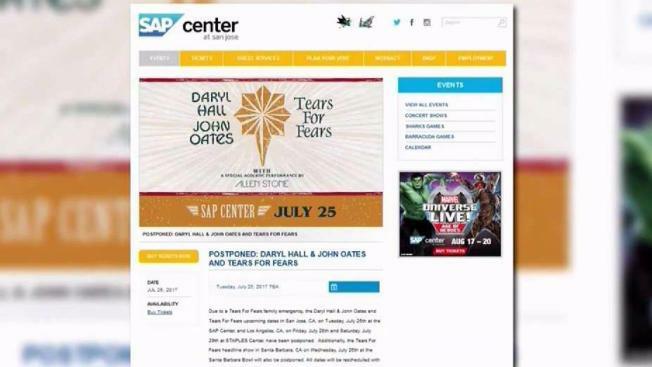 Due to a family emergency, Tuesday's concert featuring Daryl Hall & John Oates and Tears For Fears at SAP Center in San Jose has been postponed, according to a release from Sharks Sports and Entertainment, which manages the arena. The release said the family emergency was connected to Tears For Fears but it did not provide further details. The bands just played a show at Golden 1 Center in Sacramento on Sunday night. The tour also postponed shows at Staples Center in Los Angeles scheduled for this Friday and Saturday, as well as a Tears For Fears headliner show scheduled for Wednesday at the Santa Barbara Bowl. All dates will be rescheduled and tickets will be honored for those new dates, the release said.